URBANA, Ill. – Spring is a time of swelling buds and wildflowers in Illinois forests. However, you might miss the flowering display of some plants if you don’t keep a close watch. University of Illinois Extension horticulture educator Ryan Pankau has a preference for one of our native trees. “One of my favorite early spring flowers to find in the forest is pawpaw,” he says. Pankau explains that the tiny flowers of pawpaw (Asimina triloba) are often unnoticed by humans since they appear prior to leaf-out. Although quite beautiful, these minute flowers—measuring only one to one and a half inches—are an interesting shade of maroon to purple-brown. Many of our common, native pollinators also overlook these specialized flowers. “Pawpaws are pollinated by flies and beetles instead of bees, which pollinate many of our common food crops,” Pankau explains. The faint—or often non-existent—scent of the pawpaw flower mimics the smell of rotting meat. These plants evolved flowers that attract blowflies or carrion beetles who naturally feed on dead and decaying animals. This pollination strategy is more common among tropical plants, but rare among our native temperate species. Pawpaw exhibits other features of tropical plants, including specialized “drip-tips” on their leaves to help wick away water. The feature is common among tropical plants to eliminate moisture that can promote development of fungal diseases on foliage. The palm-like appearance of almost foot-long pawpaw leaves is also reminiscent of the tropics. The earliest fossil evidence of Asimina triloba originated in the Miocene Epoch (about 23 to 5.3 million years ago). At several points across the geologic time scale since the Miocene, our climate has warmed and tropical areas have expanded, subsequently increasing the range of the Annonaceae family. In addition, scientists have hypothesized that many large fruits of Central America were dispersed by megafauna that were extinct by the end of the Pleistocene Epoch (2.6 million to 11,700 years ago). These factors, among others, resulted in a plant like pawpaw, which evolved in a more tropical setting, to call our temperate Midwest climate home today. “There is evidence that humans played a role in pawpaw dispersal as well,” Pankau adds. 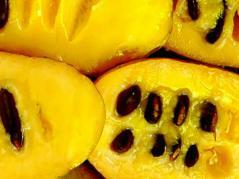 One of the earliest records of pawpaw is from Hernando de Soto’s expedition to the Americas in 1541. A Portuguese officer wrote in the expedition notes that Mississippi Valley Native Americans were cultivating and eating pawpaw. Given this and other accounts of pawpaw use by Native Americans, some dating back to over 10,000 years ago, it is likely their often nomadic lifestyle and trade with other tribes resulted in greater distribution of pawpaw prior to European settlement. Post-settlement, some of our founding fathers also cultivated pawpaw. George Washington and Thomas Jefferson included pawpaw plantings in their agricultural practices. Interestingly, pawpaw is noted to have sustained the Lewis and Clark expedition for a few weeks when rations were lean, although these fruits were certainly harvested from the wild. Pawpaw fruits ripen in the fall, producing three- to six-inch long fruits that are soft-textured when ripe and have a flavor similar to banana. Some people also compare the taste to papaya, which is likely the tree’s namesake. Due to the extremely short shelf life of this fruit, large-scale commercial production has been overlooked. However, more productive varieties of this fruit tree have been developed commercially and are for sale to home growers. “If you are interested in adding a native taste of the tropics to your home garden, consider planting a few pawpaw trees this year,” Pankau recommends.